If you live in the East Coast, you know firsthand the difficulty of finding a decent beach. For us, living in New York means that we either have to settle with the Rockaways, take out a loan to go to the Hamptons, or take our chances with New Jersey. However, if you have money to spare, Florida is just a hop, skip, and a 3 hour plane flight away from New York City. We flew in to Miami, but you could also look into flights into Ft. Lauderdale, where the prices may be slightly cheaper. "Gourmet vegan cuisine with an unbeatable harbor view"
Located between Downtown Miami and South Beach, Full Bloom is one of the most picturesque and romantic vegan spots in the city. The restaurant rests inside the Costa Brava building, and their outdoor patio has the most beautiful view of the boats and many yachts docked in the nearby marina. It was a little windy when we went, however, the strong drinks and the breezy, laidback vibe of the restaurant more than made up for it. Besides the view, the service and food are among the best we experienced while staying in Miami. We could have easily come back for dinner or brunch especially since their menu has so many different offerings. We started with a couple cocktails and the Jackfruit Empanaditas, which were delicious, but the Homemade Ravioli in Butter Sage sauce, pictured above, and the guilt-inducing tiramisu were still in my mind even after we left. If you ever find yourself in Miami, do yourself a favor and reserve a table at Full Bloom. "Humble eatery serving customizable organic and flavorful meals"
What Choices may lack in decor, they more than make up for it in their food and as their name declares, a vast number of them to choose from. We visited their Upper East Side location and were pleasantly surprised by the pack of flavor each of their item carries. Their menu is built around classic hearty items found in other vegan cafés, like the mac and cheese and the breakfast burrito. What separates Choices from other vegan spots is that most of the items are customizable. You get to choose whether you want an item either as a wrap or in a bowl, as well as what kind of veggies, protein, and sauce you want. The beauty of Choices is you really can't go wrong. 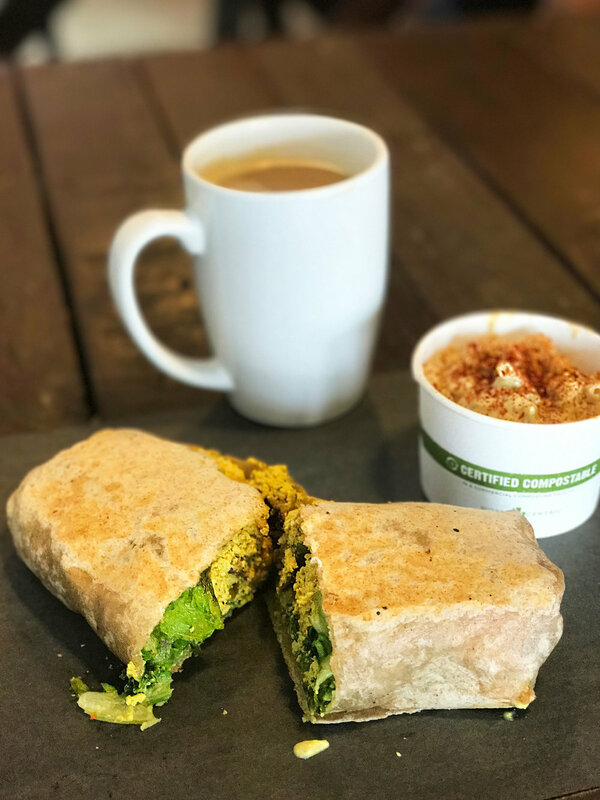 Whether you want tofu scramble in a whole wheat tortilla with their signature "cheddy" cheese or a bowl of brown rice mixed with chickpea tuna and chipotle mayo, the options are all organic and even more importantly, healthy without tasting like it. If you're looking to get your fill without having to feel guilty afterwards, Choices is a no-fail option to try. With two locations and delivery services available, it's now easier to get your cheddy cheese on. "Plant-based bar and lounge serving Latin-inspired classics"
The very first restaurant we checked out was Crate in Miami's Brickell district. From the outside, Crate was very inviting with its outdoor seating and rustic but trendy atmosphere. When the hostess led us in inside (it was a particularly hot day to be sitting outside), Dusty and I immediately exchanged somewhat confused looks at each other. Not only does Crate invite different kinds of people (from businessmen to hipsters), it seems the reason it does is because the restaurant hasn't quite decided what, and to whom, it wants to cater to. The image we saw was not at all what we expected. The huge space, shaped like a circular ballroom, had the bar at the very back, a lounge area smack dab in the middle, complete with couches that seem to only attract questionable people who wants to be gawked at (fortunately, no one was sitting on them), and the dining tables set around the empty couches, acting as a barricade, as if to warn any potential people who would be brave enough to sit on the mismatched couches. Oh, and did we mention the giant LED screen endlessly projecting a swimsuit fashion show? It was a jarring image to say the least, and unfortunately, the food wasn't much to praise either. While they do have a fairly extensive menu, we went with our waiter's recommendation, and both got the Double Bacon Cheeseburger. Perhaps it's a personal pet peeve of mine but if you order a burger, at the server's recommendation, and the patty falls apart at the first bite, vegan or not, I don't think you can call that a burger. Atmosphere aside, it's hard for us to recommend Crate without leaving a bad taste in our mouth. "Low-key café specializing in traditional French fare"
Vegan French food is hard to come by so when we found out about Eden in Eden, which specializes in traditional French cuisine, we had to make a stop at their café for brunch. We're no experts in French cuisine by any means, and my memory of France pretty much involves a lot of baguettes, chocolate croissants, getting lost in the streets of Paris, and of course, a croque monsieur. A croque monsieur, if you didn't know, is basically a ham and cheese sandwich. Many cafés have their own variations, usually with the bread, but personally, we have never had it with a bagel, like the one they serve at Eden in Eden. Surprisingly, we were all pleasantly surprised. I don't know how they made that bagel but it was soft and just "bready" enough that you can still taste the ham and cheese. The ham was yet another mystery to us, including our nonvegan friend, who was worried for us that we might actually be eating animal meat. While it wasn't quite the same as the croque monsieurs I've had before, Eden in Eden's version is still delicious and able to stand up in its own right. "Cold-pressed juice bar and café for the health-conscious vegan"
"Clean eating" has been a big trend lately, and it always baffles us when certain restaurants associate it with any animal derived ingredients. Is it just us or shouldn't the phrase "clean eating" not involve any dead animal body parts? At Downtown Miami's Manna, the phrase couldn't be more true. Not only do they pride themselves in having a fully plant-based kitchen, they also pride themselves in using ingredients in their "purest, unaltered form", while also using "organic produce, and superfoods from around the world" to create unique and tasty dishes, like the Superfood Arepa, made from ground corn, chia and flax seeds. The café also serves smoothies, soups, noritos (think burrito but a nori wrap instead of a tortilla), and, if you want something a little more filling, they also serve a variety of salad bowls, which are a healthy favorite for locals. 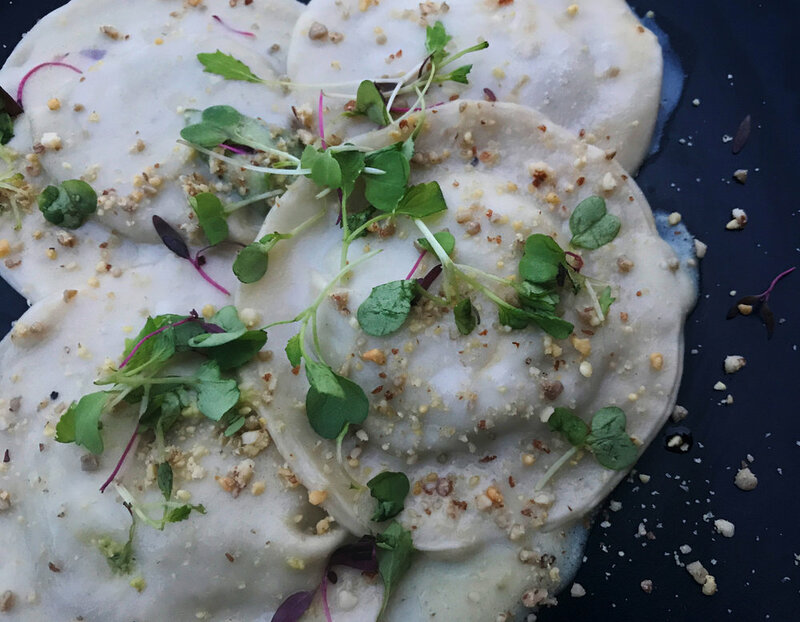 "Hip and trendy plant-based cuisine for the Miami urbanite"
GLAM has an eclectic menu and pulls inspiration from different cuisines (from Latin and Italian, to Indian and East Asian). What brings it all together is whether you're craving the meatiness from the Spaghetti with Meatballs, or the creaminess from the Farro Risotto, or even the sweet tartness from their Chia Pudding, you'll still get the bold flavors and the best of what that dish is known to offer. We don't say this a lot, but next time we're in Miami, I guarantee that we'll be back at GLAM, and we're happy to wait for our food this time. "Award-winning delicatessen serving classic deli favorites and comfort food"
Ever heard of a plant butcher? If you haven't, it's not much of a mystery. The concept is essentially the same, except for one maybe not-so-glaring difference. They serve plant-based meats, instead of animals. Today's plant butchers are on the rise and Atlas Deli is one of the few who started the movement. All the meats you've grown up with (or grown to love) are here: meatballs, turkey, sausages, chicken cutlets, and even pastrami, all created in house and shaped to mimic the texture and taste of animal meat, without having to slaughter a single being. What more can you ask for? This is the kind of restaurant that vegans and nonvegans could easily go for and a spot in Miami that we could not recommend any higher. The casual, family picnic-style dining is ideal for lunch or a midday snack. Besides their mouthwatering sandwiches and burgers, they also have one of the best mac and cheese and waffle fries that we've ever had, which begs the question: with food this good, why even bother eating animals? "Brooklyn-based pizzeria with a separate vegan menu"
Living in Brooklyn, we're no strangers to Paulie Gee, either the man or his restaurant. While the vibe is not as hectic as their Greenpoint location in New York, the restaurant that they built in Miami has its own personality. Previously an old Chinese restaurant, the new Paulie Gee's on the Upper East Side neighborhood of Miami kept some of the elements of the previous tenant, including the signage, and seamlessly incorporated their own. The result is a cool space with a Miami laidback vibe and a New York flair, complete with a vintage pinball machine. Known for their flaky thin crust and housemade cashew ricotta, the pizzas in their Miami location did not disappoint. However, their vegan options were a little lacking compared to their Greenpoint location, or other locations for that matter. Is it too much to ask for Paulie to add more vegan pizzas and desserts on their menu? All we know for sure is Miami vegans could sure use a go-to vegan pizzeria. "Elevated dining experience in the heart of Wynwood district"
Originally conceived by the somewhat legendary (or infamous?) vegan chef, Matthew Kenney, Plant Miami, under new ownership, is the ultimate vegan dining experience that Miami has to offer. Everything from the location, the ambience, and most importantly, the food, were some of the best we've ever experienced. In fact, the service was arguably too good, to the point of overbearing. We were basically attended to every 5 minutes by a rotating number of waiters and hostesses, who either had nothing to do but ask whether we were done or ask how the food was, which was the only problem that we encountered. Service aside, it was our last night in Miami and we basically decided to treat ourselves and go all out for dinner. It was undeniably pricey, but so was how delicious each meal was. I never thought I'd enjoy a vegan cheese plate as much as I did there, and the cacio e pepe will forever be the best pasta dish I've probably ever eaten. All in all, if you only had one night to spend in Miami, I'd spend it here. Have you tried any of the places that we mentioned or did we miss any of your favorite spots? Did you have a similar or a completely different experience in any of the places above? Let us know in the comments section below!